“Apologies for taking some time doing this review… it took me a while re-wiring speakers and amps and DACs, as well as this persistent head-cold that is keeping my sinuses clogged and in a condition not too suitable for critical listening conditions”. 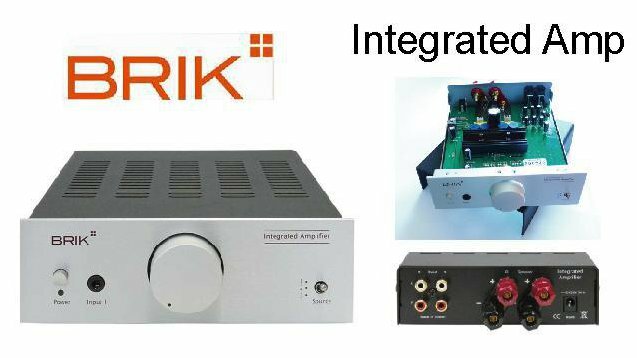 “The integrated amp from Brik is a standard desktop integrated amp. It comes with a AC adapter type power pack and in silver face like the rest of the Brik range, and in the same size, so you can stack them all up in a neat little stack. It has 2 sets of RCA inputs on the back, and a 3.5mm input on the front… which I am assuming is for plugging in ipods and stuff”. “The look is neat and nice, with just a power switch, the input, volume knob and the input selector on the nice silver brushed aluminum face plate, and nice weighty black steel around the body. The feel of the volume knob is firm but smooth and even, and does not give any indication of the cheaper price point”. “I tried it initially with Wharfdale Diamond 8.0 bookshelf speakers and the Brik DAC. The Brik drove them with ease and pulled the best out of the speakers. The sound was warm, but I think that was more from the DAC, as it was quite transparent once the Octave DAC was placed in the chain”. “I then switched the speakers to Monitor Audio RX6 and surprised to find the little amp capable of driving them pretty well, and to a decently loud level. Of course, the listening in a large room was a little more troublesome for the little 20W amp, but it was perfect for small-medium room, or for a desktop system listening at the desk or only listening from a moderate distance”. “I think this amp is a T amp, because it has that sort of sound to it. Which usually means very cost effective decent sound”. “I then connected a headphone socket (6.3mm female) cable to the speaker out, and used it to drive a K702, with a surprisingly good result. (Of course, you need to be careful not to set the volume too high … because you can blow the headphones up … if not deafen you) The sound that came out was dynamic, open, smooth and generally nice to listen”. “The bottom line is, for $200, this is a good amp. Instead of a $500+ active/powered speakers, this gives you an option of getting this amp and a $300+ bookshelves to get a pretty good stereo system. This means you can pick a variety of speakers to your liking, and drive it with a nice little amp that looks great sitting on the corner of your desk. It’s no frills approach just does the job and doesn’t try too hard. It doesn’t change the sound signature too much”. “This is a perfect little unit if you are looking to get a little amp and passive speakers for casual music listening while you work, but you want future upgrade paths open. This way, you don’t have to get stuck with an audioengine or aktimate sound and amp… you can choose from variety of budget hi-fi speakers like DALI, Wharfdale, Yamaha, Monitor Audio or anything else to your liking and pair it with the amp”. “I thought maybe it could do with a remote… one of the only gripes”. “The DAC has been written into the audio recommendation, as it is worthy of a mention. Gives you another option in the $200ish range other than stuff like Tubemagic and HRT streamer”. Dit bericht werd geplaatst in BRIK audio, Versterkers - Amplificateurs en getagged met audio, Brik, electronics, herman van den dungen, hifi, music. Maak dit favoriet permalink.